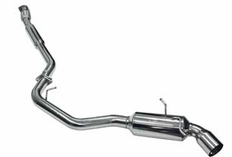 DC Sports Single Tip Cat Back Exhaust System 2008-2009 Subaru WRX 5 Door Wagon: The perfect upgrade for your Subaru, this Exhaust System replaces your restrictive exhaust with new higher flow tubing and a sylish stainless steel tip that looks even better than it sounds. An added bonus, you'll allow your engine to work more efficiently and you will gain horsepower and torque. 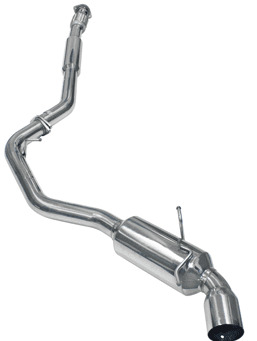 About DC Sports Exhausts: DC Sports Exhaust Systems were designed to respond to the desire of so many DC Sports Headers customers wanting to also have a DC Sports Cat-Back Exhaust. CNC Mandrel Bends with TIG welded fittings deliver perfect fit along with the revolutionary design that DC Sports is known for. Customers will enjoy increased horsepower and torque and still maintain legality as DC Sports maintains a db (noise) rating that is street legal and sounds great. No cheap tin can sounding exhaust here!! Now customers can bolt on the power of DC Sports throughout their entire exhaust system. Install time: Less than 1 hour. The part number for this item is: SCS6302 and it fits 2008-2009 Subaru WRX 5 Door Wagon Models.